An Introduction to SUSE Enterprise Storage 4! SUSE Enterprise Storage 4, the latest major release from SUSE, enabling IT to accelerate innovation and reduce costs by transforming their enterprise storage infrastructure with our intelligent software-defined storage management solution. 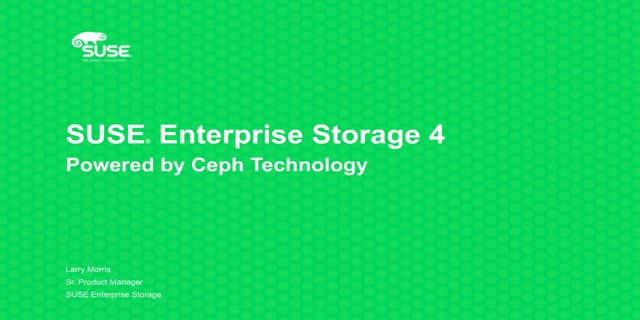 SUSE Enterprise Storage 4 based on the Ceph Jewel release includes many new and updated features that accelerate innovation including multi-protocol block, object and file system data access capabilities, multi site object replication and asynchronous block mirroring, a new open source management framework. Title: An Introduction to SUSE Enterprise Storage 4!